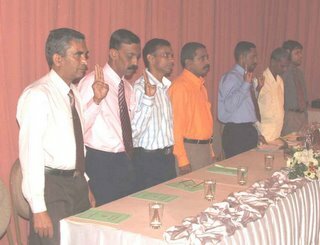 The AGM of the Old Rajans Scout Association was held at Crystal Gate Reception Hall Ampitiya on 12th November 2005 at 7pm. It followed the Annul Parents and Old Scouts Day Ceremony of The 1st Kandy Dharmaraja Scout Group, which was held at Dharmaraja College Auditorium on same day evening. The event received a memomorable participation over 150 mainly due to the influx of new members. The Chief Guest for the Old Scouts and Parents Day Mr Vijith Malagoda The Assistant Solicitor General a Old and an Old Scout whoand aChif Guset was scedued to attend the AGM as the Chief Guest but had to leave for Colombo for an urgent commitment. Mr Badnara Weerasekera – Former Group Scout Leader, Mr Shantha Madurawa – Assistant Cvhief Commissioner Sri Lanka and Distrcit Commissioner Kandy, Mr Sarath Matharaarachi – Group Scout Leader and Assistant District Commissioner – Kandy and many other distinguished Old Scouts were present. The highlight of the evening was the presenting felicitation souvenirs to veterans of the Old Rajans Scout Association. The following Veterans were felicitated at the ceremony. The Agenda was as follows. A two-piece band backed the fellowship dinner and the members entertained themselves by dancing and singing. Especially new members had a great time. The fellowship dinner was served along with music and entertainment. The event concluded around 12.30pm. Hurrah for the Organizing committee for an successful event. The Summarised Annual Report which was presented at The 27th Annual General Meeting of The Old Rajns Scout Association. We are proud to celebrate today, the 27th milestone of our journey which begun in November 12th 1978. If we turn back towards our journey it is very clear how great the achievements and the services rendered by the Old Rajans Scout Association . The association is committed to keep up Lake View Park Scout Center at its best and assisting the College Scout Group at its every endeavourer. Further the association is the key to build relationships among the members. Whilst committing towards its objectives we would like to present the summarized report of the last year. We wish to cordially welcome Mr Vijith Malagoda, Old Rajan- Old Scout – The Assistant Solicitir General Of Sri Lanka The Chief Guest for the event together with all distinguished guests, members and their families. We were able to hold 10 executive committee meetings this year. In keeping with the objective to build stronger relationships among the members, we had several meetings with the participation of family members follwed with a fellowship dinner. 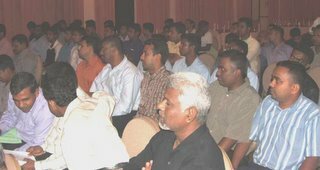 We wish to thank Mr Dudley Amarasinghe, Lalith Kuathunga and Sarath Kothalawala and the Young members of the Association for organizing and sponsoring such special meetings. Thirteen members obtained the Life Mebership this year. Mr Dileepa Wijesinghe, S C Deshapriya, R M N Rajanayake, Akila Charles, E A N Weerakkody, K D P Hemachadra, R M I A B Rathnayake, C L B Pethiyagoda, V D B Heenkenda, B M Mendis, H M I U B Heartah, R D H U Harishrandra, A M N K B Senevirathne. The activities of the year started with a Pirith Preaching followed by an alms giving at The Lake View Park Scout Centre. This is the second consecutive year which this ceremony was organized jointly by the 1st Kandy Dharmaraja Scout Group and the Old Rajans Scout Association. The Old Rajans Scout Association together with the the 1st Kandy Dharmaraja Scout Group organized a relief aid programme for the Trincomalee District Deserters from the Tsunami disaster. We were able to build many sanitary facilities for the community with the equipment collected by us. Our Special thanks go to Major Ravidra Perera Of Sri Lanka Armay a Old Scout , Mr Sudarman Nadaraja of UNICEF organization for providing us with facilities to organize the project, and wish to thank all Old Rajans Scouts participated for the event. As per the tradition, ORSA was able to organize both the Day Trip and the Two Day Trip this year. The Day trip covered Norton Bridge, Lakshapana Reservoirs & Power Houses and Kithulgala. The participants were able to gain valuable knowledge about the power houses at Laxapana Power Station. Mr Aloka Perera Old Scout who works for the CEB has obtained authority to visit the power house and we wish to thank Mr D B Dissanayake – Mechanical Engineer CEB, Mr Senevirathne Of CEB and Mr S S B Karunarathne the Chief Engineer – Laxapana Power House for their assistance. The two day trip covered Randenigala Reservoir, Badulla, Bandarawela, Haputhale and Nuwara Eliya. The group got an opportunity to visit the operating tunnel of the Randenigala Dam and to visit many important places on the areas visited. Our sincere thanks go to Mr Rohith aAruppola – Chief Engineer Randenigala Project, And Mr Thilak Jayasiri – Group Scout Leader St Thomas College Bandarawela for their assistance. The Annual New Year Festival organized by the association was held at Pallekelle Scouts Ground. This is manly aimed for the children of the members as an entertainment event. 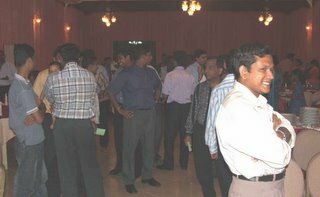 ORSA wish to thank the organiseres Mr Saliya Dhanayake, Mr Namal Palliyagruruge, Mr Gayan Gunawardena and the team for a very successful event. Further association thanks Mr Upul Dayananda, Mr Suminda Vithanaarachchi , Mr Darshana Samararathne for sponsoring the gifts and Mr Dasanasiri Dasanayake for providing the lunch. The Association printed a school bag for the Dharmaraja College schoolboys. This enabled the students to obtain a bag with the College Colors and crest at a lower cost. It also enabled the association to raise funds. We thank Mr Shantha Madurawa, Mr Sadara Thennakoon and Mr Asitha Edirsooriya for providing the capital to start up the project. We suggest this project to be continued for the future as a fundraiser for the association. Further the Association commenced operating a Communication Shop at the Lake View Park Scout Center as a Long term fundraising project. The annual Cricket Match with The 1st kandy Dharmaraja Scout Group was held at Mahaweli Uyana Grounds at Aruppola. We wish to thank Mr Priyantha Molligoda Old Rajan for sponsoring the event and Mr Suminda Vithanarachi for coordinating the sponsorship. Further the association thanks the Scouts participated for the match. Special thanks go to Mr Asitha Edirisooriya for providing the participants with lunch. The annual alms giving organized by the Association to commemorate Mr Henry Steele Olcott the founder of Dharmaraja college, was organized at the Asgiriya Mahavihara for 110 incumbents. The association specially thanks the Principal for his assistance, the college staff, Mr Asitha Edirisooriya for organizing the event and the members & families participated for the event. It’s our sincere responsibility to protect and develop the Lake View Park Scout center the official Scout Center of the 1st Kandy Dharmaraja Scout Group. The association is engaged in operating continuing projects to develop the park. This year the association organized a Tree Planting Project at the Lake View Park. Old Rajan Mr Kavan Karalliyadda donated us with valuable plants for the project; we wish to thank Mr Thissa Jayasinghe for providing us with residents of the Open Prison for assistance. We are presently operating branches in Australia, USA and Canada. The USA and Canada branches were formed in this year and we wish to thank Mr Shantha Madurawa for initiating ,the opening of branches and Mr Lalith Perera a resident old rajan scout for promoting the branches. Further we wish to highlight the financial assistance provided to us by Mr Mahinda Bandara Godakale a scout parent employed in Italy. The members were engaged in participating as judges for the annual inter troop competitions. However the member participation were low and we have to pay more attention for the event in coming years. The best scouts awards presented annually by the Old Scouts Mr S K Madurawa, Dr S Dolaphilla, Mr Asitha Edirisooriya, Mr Saminda Basnayake and Mr Aruna Gunasinghe were presented this year too. We wish to thank them for sponsoring the awards and wish to congratulate the scouts who obtained the awards. 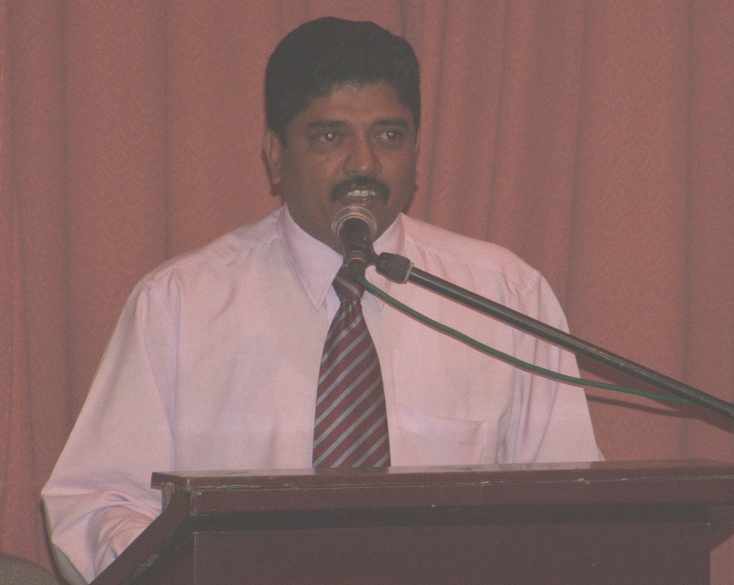 The association congratulates Mr Sarath Mataraarachi Group Scout Leader for being elected as the Assistant District Commissioner – Kandy District and Mr Sarath Kumarasinghe for being elected as a Headquarters Commissioner of the Sri Lanka Scouts Association. Passing Away of Former Governor of Central Province – Mr Monty Gopallawa a well-wisher and promoter of Scouting movement. We wish to thank Mr Vijith Malagoda Old Rajan- Old Scout, Assistant Solicitor General of Sri Lanka who participated today as the Chief Guest, The Principal Mr S M Keerthirathne who is always prepared to assist the association, Assistant Chief Commissioner – Sri Lanka Scout Association Mr Shantha Madurawa, The Group Scout Leader Mr Sarath Mathaaraarachchi, The President of Old Boys Union, Patrons of the Association. Members of the association and all who helped us in numerous ways.